If you’re the type of girl that loves her fair share of outdoor activities you may have no problem signing up for a hike, long bike ride, or paddle board session. 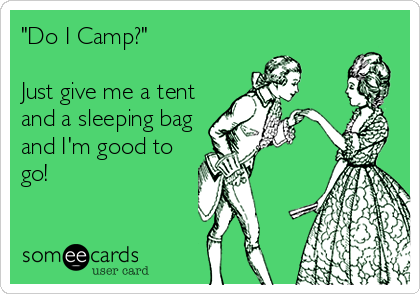 But just because you like the outdoors, doesn’t necessarily mean you’re an expert when it comes to camping. Voluntarily sleeping in a tent for a few days and giving up your daily routine may be a little intimidating for some gals. How can you ever go a day without a decent shower or your daily essential products?! Well, if you find yourself committed to a camping trip you’re not so sure of, I have a few simple tips that will help you look and feel good while roughing it. You may not be an expert, but at least you can keep up with the guys and still feel like a lady. Whether you’re camping in the mountains or in the desert, chances are your hair won’t be feeling as fresh as you like it to. Depending on your camping location, showering may not be an option, and even if it is, you won’t have all your tools there to coif your do just how you like it. Rather than dealing with an oily mess on top of your head for the duration of your trip, opt for an easy and cheap solution­—dry shampoo! One of my favorite products that I take with me everywhere, not just camping, is Dove’s invigorating dry shampoo from Target. This inexpensive dry shampoo instantly soaks up the excess oily and leaves your hair looking and feeling a lot better! It also smells amazing! If you’re going to be sharing a tent with someone, the least you can do is make sure you smell as clean as possible. Best of all, dry shampoo is so easy to use, you don’t even need a mirror. All you do is spray on your roots, brush through, and you’re done! Camping entails tons of outdoor activities, and that can also mean being out in the hot sun for hours on end. To protect your face and look stylish at the same time, I suggest wearing a cute and practical hat! I love this straw fedora from overstock.com because it’s a nice light hat that won’t make your head hot and the straw material gives it a cool and casual feel that won’t come off as overly dressy when your camping. In addition to protecting your face with a hat, most girls prefer wearing sunblock in addition to ensure they done get a sunburn. A great way to keep yourself looking good and protect your face at the same time is applying a small amount of tinted moisturizer to your face. For many girls, leaving home without a few make-up essentials is rough. Whether you love wearing mascara, lip-gloss, or some other product, you may feel naked without anything on your face. I love Stila’s tinted moisturizer from sephora.com because it’s light, soothing, and gives your face a nice glow that last all day. It also contains SPF 20, which will protect your face from the sun. This way, you can keep your face looking gorgeous, but you won’t be labeled as a princess for packing your entire make-up bag for a camping trip. Aside from maintaining your hygiene as best as you can, you want to make sure you pack the right clothing. When camping, comfort is very important, but if you’re the type of gal that likes looking stylish no matter what, picking out the perfect outfit combinations is important. I suggest packing dark colored pants, either stretchy jeans or yoga pants. Dark colors won’t show dirt as much as light colors, and the flexible material will allow you to move about freely throughout your wilderness adventures! I’m obsessed with these charcoal stretch skinny jeans from Nordstrom.com! They are a fun unique color that won’t look dirty right away, plus they are super comfy! You can easily wear them with boots or roll them up a bit and wear them with your favorite sneakers! Any fashionista knows that the best way to top off any outfit is with jewelry. Camping requires easy accessorizing that won’t get in the way and won’t make you look too done-up! I love emitations.com stud earrings because they offer every gal a cute accessory that effortlessly adds some sparkle to her camping attire. Express your personality and keeps things simple with any of their affordable stud earrings. While not every girl is an expert in camping, every girl can easily maintain her style sense and her sanity while roughing it. These easy steps don’t take much out of you and can easily make your next camping trip a huge success! 1) If you’ve got long hair, and will only be camping a couple days, put it into two tight French braids. That keeps it out of your face, and no one can tell if it hasn’t been washed. Also, you look adorable in the photos with braids. 2) Keep an eye out for sales, or find a place that sells inexpensive clothes. Buy blouses or sweaters for $5 and wear them camping. You’ll look amazing, and if the sleeve snags and tears, it’s no big deal. 3) Same thing for jewelry. Inexpensive bangles and beads set you well apart on the trail, and if you’ve picked it up at a yard sale, you won’t stress about whether it’ll fall into a creek and be lost forever. Just be mindful of anything that might be impractical. You might have to use your hands to climb over something, so elastic bracelets are good. Dangly earrings or necklaces could loop around something at the worst time, so shorter is better. I love those tips! Especially buying cheap blouses! Thanks! LOL! Now that’s a good list! I do shower every morning when we are out camping; but otherwise, I’m fortunate that none of us are worried about fashion when camping! We lather on the sunscreen, we all wear caps with our hair piled any which way on top of our head! I do have clothes that have gotten too worn-out/stained/splattered with paint and those get moved into the camping drawer. That way the clothes I wear I don’t have to worry about! A big one is try and stay as clean as possible and have at the very least a travel bottle of body wash available. Campsuds biodegradable wash is excellent, that way if you come across a lake, stream, etc… you can get cleaned up and not have to worry about disturbing the local ecosystem. I also use a tinted moisturizer/sunblock, but I also carry just some cheap E.L.F blotting papers with me to absorb excess oil from my face. Great post. Great tips, braids and dry shampoo are a must! Another must have for me are body wipes. They sell them at REI and most outdoor stores and are great if you can’t get to a shower for a day or so. Very refreshing! Sephora also doesn’t exist here. Urgh… and any outdoors store not even think about selling girl stuffs, so I get some of my stuffs shipped from overseas. Do you have Mary Kay? They sell a nice tinted moisturizer with SPF 20 and are in many countries worldwide. Be careful to use UNSCENTED dry shampoo if you’re camping in an area with bears. The scented versions can attract bears! I like your ideas. Besides often going camping with the Boy Scouts, I recently finished the 800+ kilometer Camino de Santiago de Campostella, walking solo across northern Spain (40 days). Showers were available almost every day, so shampooing wasn’t a problem, only the weight of the bottle! Most pilgrims only took one outfit to wear, one to change into and, again, weight and multi-function were the priorities. I had two hats, a baseball cap and a “booney” hat. Also, a combination moisturizer/sunscreen. I saw that most people can go a day or two without a shower and/or shampoo and look great – it was simply a matter of the size of their smile!! Thanks for liking my blog – I think yours is terrific. I am going to seek out the dry shampoo. Thanks for the suggestion!